Hello, friends! Welcome back to the final day of The Ton’s Anniversary Release! We hope you have enjoyed all of the previews and inspiration. Today, we are showcasing the final sets in our Anniversary Release lineup: Friend Defined, Love Defined, HauteWedding Dress, and Wild Morning Glories, which brings the total number of stamp sets to SEVENTEEN, including four rubber background sets and thirteen clear stamp sets, as well as two amazing new dies. All of the products that have been previewed over the last four days are available right now on The Ton’s website. My first project for today focuses on two of the new sets from this week: Haute Wedding Dress and Fresh Cut Roses. This dress…. oh, this dress. When I first got the stamp sets, I may have squealed in excitement when I came to this set. This image is the epitome of class. It’s large enough to really be a focal point on a card. And there are so many fun ways to customize it…. you’re going to just love this set, belieeeeeve me. To start, I heat embossed the image on a sheet of my favorite watercolor paper using gold embossing powder. Then came my most favorite part: the coloring. I know, I know, wedding gowns are supposed to be white or cream, blah blah blah. My hubby and I got married right before Pinterest, do-it-yourself, “unique” weddings exploded into their current state of awesomeness. There are so many things that are popular now that I wanted to do then, but they weren’t really “the way things were done,” so I just had to put my ideas aside and be traditional. One of the things I would have done in a heartbeat was have a blush pink wedding gown. Alas, my wedding gown was a very lovely, but very ordinary white, and my hubby thinks vow renewals are a waste of money (only when he’s the one spending it. They’re fine and dandy for other people. ), so I will have to have my pink gown on a card. SO, back to the project, I colored my image with only three Zig markers, fussy cut it, and set it aside. I then stamped all of my roses from the Fresh Cut Roses set using the Ruby Couture Color Collection. The leaves were stamped with just the base layer using Delicata Gold ink. I fussy cut all of them out and turned my attention to the shaker. I mounted a panel of patterned paper in a lacy gold foil pattern on my card base. I then die cut an oval from an A2 sized panel of bubblegum pink card stock and filled my shaker with various sequins from The Ton, including Gold Posies, Nugget Seed Beads, and Pink Heart Confetti. A couple of gold foil die cut flourishes were added to the floral cluster to frame the shaker window. I didn’t add a sentiment, because I thought the card could potentially be used for several occasions, perhaps for a shower or asking a friend to be a wedding attendant. My next project uses only the Haute Wedding Dress stamps, with a sentiment from Timeless Icons Sentiments. It’s nice and flat, perfect for mailing. I started with an A2 panel of watercolor card stock and heat embossed the dress, with the accompanying floral applique on the bodice and on the bottom edge. I then used the same floral applique stamps to add some dripping flowers to the top corners of the panel. I watercolored the image using my Zig markers. 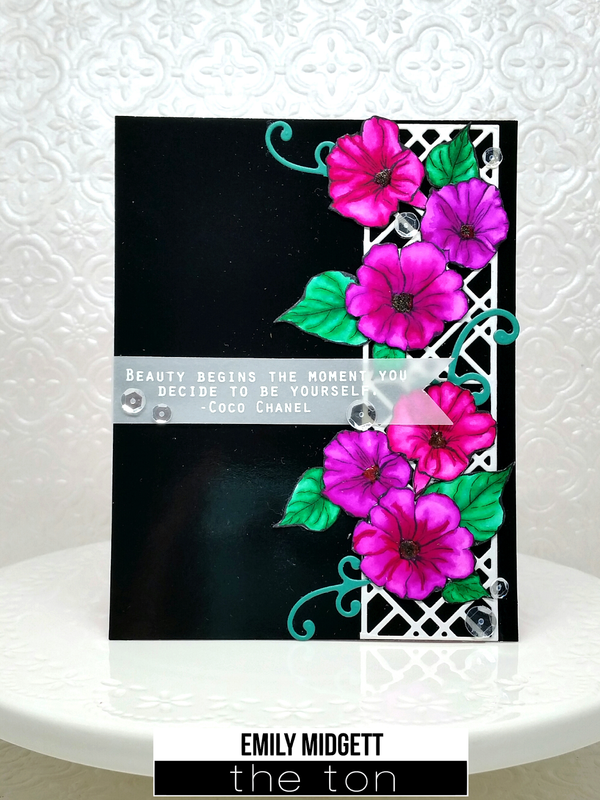 I heat embossed the sentiment from Timeless Icons Sentiments in the same white pearl embossing powder and began adding color to the background using Broken China Distress Ink, water, and a Paintbrush. I simply tapped the Broken China inkpad on a clear stamp block and diluted it with water, concentrating more color on the sentiment and in the corners with the flowers, so that the white pearl heat embossing would stand out. A few sequins “floating” gives the illusion of the woman being showered with flowers. My final project for today focuses on the Wild Morning Glories set. I love that this set is so versatile… you get solid stamp images along with the outlines, so you have the option to stamp and get great depth, or stamp just the outlines and color them to create depth. (Guess which option I chose??) I stamped the outlines of the flowers and leaves on some watercolor paper, then colored them with my Zigs, concentrating the color in the centers and around the edges, then using my wet paintbrush to pull the color out, making sure that the lightest sections were in the broadest part of the petals, as (in my mind) that is where the light would be hitting the flower most strongly. I know the coloring isn’t perfect, but it’s satisfactory to my novice eyes. 🙂 I adhered a section of the Lattice Cover Plate to the side of my glossy black background, then arranged the flowers and leaves to be “climbing” up the side, as real morning glories do. I added a few little flourish die cuts to add a bit more color and to mimic the tiny, curly sprigs that are on morning glory vines. The sentiment, a favorite from the Timeless Icons set, was heat embossed onto a strip of vellum, then the end was cut into a flag. I wrapped it around the glossy black card stock panel and adhered it, then added a couple of dots of adhesive in strategic spots, which I later covered up with some Glass Slipper Sequins. The finishing touch was some Glossy Accents in the center of each of the flowers. Your cards were my favorite today! Stunning! Lovely cards! The wedding dress is breathtaking! Your water coloring is gorgeous! Really makes the dress 3D. Beautiful cards love the blue with the dress. So pretty. All 3 cards are gorgeous! I can't decide which is my favorite! I love the lace background of the shaker. The color combination (blue/peach) of the second is beautiful. Also, I like how you created the trellis for the "morning glories". Gorgeous! Love the soft look of the bride cards and the bold and striking design of the Morning Glory card! Lovely cards! So clever using part of the geometric lace die cut for a trellis. Beautiful cards!! I love the contrast of the last card…so gorgeous!! 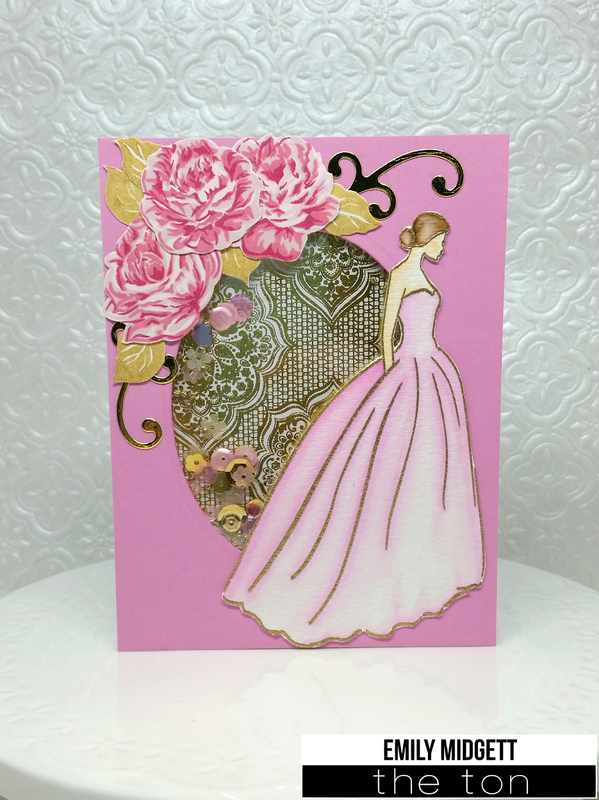 Gorgeous cards showcasing the dress and the flowers. LOVE the elegance of the Bride cards! and the Morning Glories are STUNNING! Your pale pink blush gown would have been stunning I bet! I can get enough of those morning glories – your coloring makes them literally look 3D to me! Oh wow! These cards are so cute!!!! And I love these colours!!!! Thanks for sharing!!! 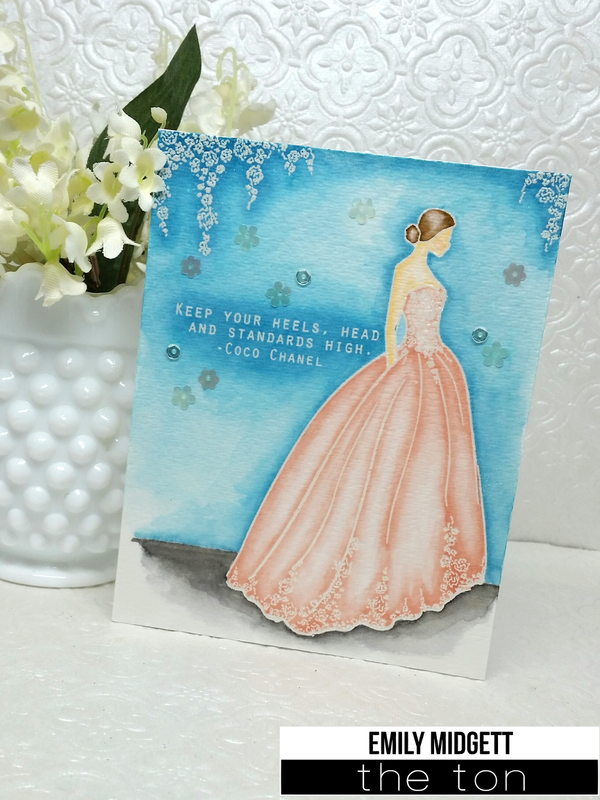 Gorgeous soft and sweet bride cards and the stunning vibrant morning glories card is so beautiful! Beautiful cards! Love the colors and the lattice on the last card! These cards are AMAZING!!! I think you did a fantastic job! Hats off to you! Love all your gorgeous cards! I really love the Haute wedding dress. Sigh… such gorgeous eye candy! Love that shaker! And the flowers on the dress and draped over the top of the card! and those stunning morning glories!!! Sigh! Your cards are beautiful. Love todays releases. wow these are so incredible!!! I LOVE that blue background with the dress, just jaw dropping gorgeous! Love the dress cards they are so pretty. Beautiful cards with amazing color! stunning cards!!! I love your watercolored card especially with the striking blue background! Such pretty cards! I love the one with the blue background and the wedding dress. Thanks for sharing your beautiful cards. LoVe them.